It has been 23 years since Natalia Mishkutionok and Artur Dmitriev took their final bow as a competitive pairs team and went their separate ways. Mishkutionok moved to the U.S. in 1995 and now coaches in Dallas, Texas. The 1992 Olympic champion looks back on her storied career, and her journey to the present. At age 16, you left Belarus and went to St. Petersburg, Russia. What prompted that move? I was training in Minsk as a singles skater. My rink hosted a pairs camp and Irina Rodnina came with some of her students. After watching them, I decided that I wanted to try pairs. Irina was from Moscow, but I did not want to move there. I had never been to St. Petersburg, but there was something I really liked about the city — even without ever having been there. I went to a competition with a lot young skaters and junior pair teams, similar to the old U.S. junior nationals. Ekaterina Gordeeva and Sergei Grinkov and a few teams from the St. Petersburg school that I really liked competed there. Watching them do lifts and throws — I just found it all so exciting. Igor Moskvin, Tamara Moskvina’s husband, coached them. I told my mom I wanted to do pairs with Igor and Tamara. She asked me why I didn’t want to go with Irina since we already had a relationship with her, but I really wanted to go to St. Petersburg. So we went there and spoke with Tamara. She told me I could stay for a week and then they would decide if they would take me on as a student. After the week was over, Tamara said she would like me to stay, so I moved to a sports school there. Is that how the transition from singles to pairs skating came about? When I was very young, there was a boy in Belarus who was coached by his parents and they really wanted me to skate with him. In Minsk we had two skating clubs. Everything was state funded, so with one club I could get a coupon for food and about 1 ruble a day, but with the other club I would get a food coupon and 6 rubles per day. The boy was a member of the club that gave 6 rubles. Back then my mom did not have a lot, so this was a really good opportunity for me to help her. But I did not want to skate with that boy. I was young and not really ready to try pairs at that stage. After Irina started coming to our rink and I saw the pairs at the big competition … that was when I decided that I wanted to try pairs. In St. Petersburg, I took lessons from Alexei Mishin in singles, but I did not compete because it would have been impossible to train for both. How did you and Artur Dmitriev become a team in 1986? In Russia, training is a bit different. All coaching teams have their own private ice and on Tamara’s pairs sessions there were a lot of boys and girls without partners, but none of them could be paired because they did not match. However, they would practice with each other. When I moved there they had me work with one boy to improve my pairs elements. We skated together for about three months and even did a little exhibition program together. He was a bit too short for me, but it was good experience. Artur came to St. Petersburg from Norilsk in northern Russia. He had a partner when I arrived in St. Petersburg, but at some point, Tamara decided she was too tall for him. At that time, Denis Petrov moved to our school. One day Tamara asked whom I wanted to skate with — Denis or Artur. I did not know either of them, but I had done a few elements with Artur when I first moved there and he had been really helpful. I said Artur. I do not know if my opinion mattered. I am sure that Tamara had already made up her mind, but I guess she wanted to make sure that I would be OK skating with Artur. Tell us about the early days of your partnership and how the Soviet system worked in your era. It was a lot of hard work both on and off the ice — it is the Russian way. I had to learn everything the way Artur did it. I did not have much experience, so that was not a big issue — it made the process a lot faster. Our coaches helped us a lot and Artur was very patient with me. We had a very good support system, which my mom was a big part of. Without her I do not think I would have achieved any of the things I did. Every year, all the skaters had to go to the Russian Sports Committee with a training and competition plan. At the beginning of the season, we all knew what we were supposed to accomplish — placements that were expected at each competition. I remember one year Artur and I were supposed to place first or second at Europeans, but we came third, so the committee did not send us to Worlds because we did not accomplish that goal. After claiming bronze at 1990 Worlds, what were your expectations for the following season? I always wanted to be a champion, but when I was on the ice competing I never thought about winning medals. I always just wanted to do my best. If I did that I was happy — if I did not skate well I was not happy, even if I won a medal. I did not think much about winning Worlds in 1991. I knew that I had to do my best if I wanted to be the best in the world, but I really never thought about winning a specific event. Did entering the 1991-1992 Olympic season as World champions put extra pressure on you to win the Olympic title? Going into the Olympics as the reigning World champions is never helpful. When you are on top it is really hard to stay on top. When you are on the bottom it is mentally much easier to get to the top, but if you are there already it is much harder to stay there. It is not that hard physically, but it is mentally. Everybody expected us to place well at those Olympics so it was a lot of pressure, mentally, for us to deal with. Why did you keep the 1991 “Liebestraum” long program for the Olympic season. At that time in Russia it was not uncommon to keep a program for a second season, especially if you were trying to learn to incorporate new elements into the program. It helped to make sure that everything felt comfortable, and spending more time on a program meant that the choreography could really be polished. The “Liebestraum” program was really good for us and our coaches decided that we should keep it. I think Tamara also thought that certain things could be better, so she really wanted us to focus on the elements and polish the nuances of that program. Is there any specific performance of that program that stands out the most? I think the 1991 World Championships was the best performance of the program. No one really expected that kind of performance from us — we did a really good job. Walk us through your free skate at the 1992 Olympics. I was not happy at all with my performance. Back then, while performing the program, we could decide if we wanted to do a double or a triple jump or a throw. It did not matter much what we did, but when you are under a lot of stress it is very difficult. At that competition not many other teams had a side-by-side triple jump, so Tamara told us to decide after the triple toe loops if we were going to do a double or single Axel. I messed up the toe loop — I under-rotated and two-footed it — and then as we continued on in the program Artur asked me what we were going to do on the Axel. I was so nervous — I panicked and said ‘double’ and then I popped it into a single anyway. As a coach myself now, I would not ever tell someone to make a decision mid-program. Going into a performance you need to be set on what you are doing. I am not blaming our coaches — they were doing their best to help us, but it made everything very stressful. I could not focus the way I needed to, I was just too nervous. After retiring in 1992 what prompted you to reinstate for the 1994 Olympic Games? Back then, if you were a World and European champion and an Olympic medalist you moved on to shows or professional competitions to make money. As an amateur you made no money, unless you were lucky enough to make it onto Tom Collins Champions on Ice tour or Stars On Ice. Then the ISU changed the rules and allowed professionals to reinstate. Artur and I thought about the possibility and wondered if we could still be the best. We decided to come back, like many other skaters. Personally, I decided to come back because I did not skate my best in 1992 and I wanted a second chance. Did your personal situation with Dmitriev change between 1992 and 1994? I do not think things changed that much between us. He announced to me that he was going to be a father when we were in Albertville (at the 1992 Olympic Winter Games). I was not too surprised, but it was not necessarily something I expected. I knew that at the end of our career he was going to have his life and family and I was going to have mine. I was happy for him because he had found someone that he really loved and was going to have a child with her. What were your expectations heading into the 1994 Olympic Games? It was not easy to come back and get in shape. It was very difficult for me. We had done a lot of professional shows and competitions, but you do not train the same for those as you do for competitions. Looking back, I probably should have trained a bit harder for those shows. It was a lot of work to get back in shape, but it was also a lot of fun. I remember the year that we came back. We were in Colorado Springs, Colorado, training for the summer, and Tamara chose “Swan Lake” for our free program. We started doing the program, but Artur and I both felt we were not “Swan Lake” skaters — we were more powerful and athletic — but Tamara believed that it was the right music and wanted us to give it a try. Tom Collins found the Rachmaninoff music for us while we were on his Champions on Ice tour that year. We listened to it and decided that we wanted to change the music. When we returned to training, we changed the program. Tamara was concerned that it was too late — too close to the start of the season. But when she saw us move to the music she agreed to it. It was a really good piece of music for us. Why did you bring back the “Don Quixote” short program for the 1993-1994 season? During the 1991-1992 season, we actually had another program that we used up until Europeans. Tamara wanted us to standout and be different that season, so she decided we should skate to “Can-Can.” Artur and I were not really “Can-Can” people, but the program was really well done and a lot of fun. My daughter, Natasha, found a video of it on YouTube a couple months ago. I had completely forgotten about it, but when I saw the costumes I almost fell over. I wore green tights and a green top and Artur was wearing black pants and a pink top — that was really interesting. The program itself was really good, however, as a skater I did not feel like the “Can-Can” suited me. We went to Europeans with this short program and the judges told us that they thought we should change it. Since the “Don Quixote” program was new in 1992, we decided to reuse it in 1994. I was not worried about our performance not being as good as in 1992 or how they would compare. It was a good program and I really liked it, so I was not upset that we went back to it. The Rachmaninoff music was a really strong piece. In St. Petersburg there is a lot of important architecture and history and I felt that Rachmaninoff really reflected its history. The music is really strong and it felt really good to skate that program. “Liebestraum” is a beautiful piece of music that allowed me to show off my flexibility. A lot of things were permitted back then. We could do some really neat things with our choreography and elements. We were both older and more mature at that point in time, and the Rachmaninoff music suited us both a lot better. Can you talk about your reaction to the Olympic result in 1994? Personally, I was happy to have just gone out and done my best. I was disappointed that we did not get the gold medal, but I was still very happy with my performance and my silver medal. I tell people that I actually like my silver medal more than my gold because my performance was so much better. I was happy that we did the best that we could and that we got a medal. Now, looking back, I think it would have been nice to get another gold medal, but I am still happy with what I did. I cared about medals, but I cared more about my performances. We skated our best and people really liked our performance and to me that is really what matters. Was retiring after the 1994 Olympics always your plan? After the 1992 and 1994 Olympics, we had achieved so much. Russia had a lot of good skaters coming up and there were many teams that were also very good and hungry for success, but they never got the chance to compete because we were better than them. So, in 1994 I was happy with what I had done and I decided to move on and give some of the other skaters the chance to compete at Worlds and Europeans. I do not know if it was a good choice — maybe I should have stayed, but I felt that it was time to move on and maybe have a normal life. Dmitriev continued competing. How did you feel watching him skate with another partner? It was a bit uncomfortable because everyone was comparing our partnership to his with Oksana (Kazakova). Artur loved skating — he is very creative and I was happy that he found another partner that was able to help him win a second Olympic gold medal (in 1998). Watching them at first I thought, ‘maybe I should not have quit,’ but now I think that was silly. I was really happy for them and all they achieved. Throughout your career you trained alongside many of the top Soviet/Russian teams. Did that rivalry make you a better competitor? I am 100 percent certain that it made me a better skater. When I started with Tamara, her top team was Elena Valova and Oleg Vasiliev and I trained alongside them. Around the time that Artur and I began skating together, Tamara paired Elena Bechke and Denis Petrov. We trained together on the same ice every day, and competed against each other. We really pushed each other to be the best. There were other teams at the rink, but Elena and Denis were really the ones pushing us. When I was a singles skater I had no trouble with my triple jumps, but when I started pairs, I had to spend a lot of time working on the pairs elements and I lost some of the consistency I had had with my triples. At the same time, Elena was just learning her triple jumps and I remember we would play games together, seeing who could land the most of each jump. She worked very hard and that really helped push me to improve the consistency of my jumps. During your career, you skated under three flags: USSR, Unified Team and Russia. I remember at the 1992 Olympics I asked Tamara if we were going to have a Russian flag at the medal ceremony. She told me we would, but then I saw the Olympic flag and I was so surprised. I do not think that she wanted us to think about things like that and that is why she did not tell us. Our coaches really protected us from all the turmoil. However, in my mind, I always competed for Russia so it did not matter what flag was used. What prompted your move to the U.S. and why did you settle in Colorado Springs? After I retired in 1994 I decided to take a bit of a break. After being constantly busy with training and competing all of a sudden I had nothing to do, and I could not decide what I wanted to do. My mom and my coaches were concerned because I got out of shape and was not happy. Eventually, I decided I wanted to study English because at that time, my English was not very good. In 1995, Tamara helped me to get into New York University. It was a three-month program and I was supposed to complete the course and then return to Russia. At that time, Irina Vorobieva (the 1981 World and European pairs champion), was coaching in Colorado Springs and invited me to visit. In New York I had seen a professional competition and I really started to miss skating so I decided to get back into shape. Irina told me about the off-ice trainer who worked with her skaters and arranged for me to work with him when I visited. That is how I ended up meeting my first husband, Craig Shepherd. He was Irina’s off-ice trainer. I did not plan to stay in the U.S., but I did. A lot of the skaters in Russia wanted to move to the U.S., but I always said I would never move. I loved Russia so much and I never thought that I would want to be anywhere else. I also said that I would never become a coach. I had seen all of the work and stress Tamara and the other coaches went through with me and the other skaters — it is a tough job — and I just did not want to have that life. But I ended up in the U.S. and I became a coach. Never say never! What prompted the move to Dallas, Texas in 2001? In Colorado, Irina and I had one pairs team and neither of the skaters had a lot of money. I was also coaching a pairs team from Europe. We heard a rink was opening in the Dallas area that was offering free ice for national and international skaters. That was a big draw and really why I moved. I wanted to help my students be the best that they could and that rink provided a great opportunity for them. It was a great facility with three ice surfaces, but it was in the middle of nowhere and it went bankrupt without the population to support it. I brought a few students with me, and I had a lot of young skaters, some of which went on to compete internationally. I had put my heart into it and realized that I really liked to teach. Luckily, some other new rinks opened in the area so I was able to move. What are your thoughts on the current judging system? As a coach, everything is much easier. I had to learn things like spin and footwork levels, but it was not too bad. It is so much easier to explain to skaters and parents and to show them why they placed where they did. At each event you know which jumps were clean, which were downgraded, what the spin levels were and what the judges thought about the program. With the 6.0 system, you would just get a sheet with ordinals. Some judges would have the skater first, one would have them last and one would have them third — there was no explanation. This way it is pretty simple and it makes it easier for the skaters to see what needs to improve and what goals they need to work toward. Your daughter, Natasha, is a competitive skater. Was it her own choice? 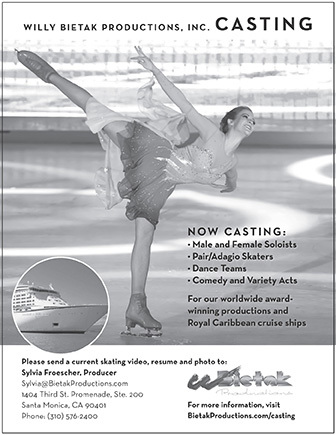 When did Natasha get interested in pairs skating? During the last Olympics, Natasha watched the pairs and then asked if I could find her a partner. I told her that maybe, when she got a triple (jump) and a double Axel, we could look, but I really did not think anything would come of it because in the U.S. it is very difficult to find a pairs boy. When I talked to her about having a tryout with someone, she was really excited. She has just started pairs at the juvenile level with Daniel Tioumentsev. He lives in Colorado, so the two of them go back and forth. As a juvenile team they do not need to always be together, but I think that they will look fine for sectionals and hopefully nationals next year. Since they do not train together all the time I don‘t think that it is as much fun as she had hoped, but she is still enjoying it. I have a collection of CDs with all my old skating programs, as well as some other music that I like. At the end of the season I bring the discs out and let the kids pick some different things and play around with them on the ice. I had a pairs team a while ago that skated to “Don Quixote” because it was the right style for them. When Natasha was looking through the CDs she picked that one. She put a program together herself and it did not look bad, so I let her keep the music. How do you balance home life and skating? It is tough! It was not that bad when Natasha was younger, but now it is a bit more challenging. She wants me to coach her, but I am also her mom. She does not listen to everything I tell her so I try to have her work with other coaches. She is also at the age where she thinks that she is always right. When she is in a good mood it is a lot of fun, but sometimes I get tough on her and expect more from her because I know she can do more — then things do not work so well. Are your surprised about how many children of former Olympic champions from Russia are competing today? No not at all. I kind of feel badly, though, because my daughter is so much younger than all of my friends’ children. Natasha recently went to a pairs camp in Colorado Springs — it was a last minute thing and I could not go with her, but the mother of her partner sent me a video of them working off ice with a lady who looked very familiar. When Natasha came home she told me that it was Artur’s first wife, Tatiana (Druchinina). It was so crazy that she was there working with my daughter. Life has really come full circle. Do you stay in touch with Moskvina and Dmitriev? We usually go to Russia every year, but this year we cannot because Natasha is going back and forth to Colorado. Normally when we go we see Tamara. Last summer we went to Sochi and Artur was there with a few of his pairs teams, so Natasha got to meet him. We do not talk all the time, but we have kept in touch over the years. Are there any pairs teams competing today that you personally like? Because of my involvement with my own teams I have not been paying a lot of attention to the top skaters. We watch nationals and of course Worlds, but I do not follow it that closely. However, I really liked (Aliona) Savchenko and (Robin) Szolkowy and now I like Savchenko and (Bruno) Massot. I also really like some of the Russian and Chinese teams. What advice do you give young skaters who dream of becoming Olympic champions? It is a lot of hard work, that is for sure. You have to be very focused and willing to put in the time. If you have a good coach, supportive parents and talent you just have to put in a lot of work.